Photos via (clockwise from left) Pottery Barn Teen, The Wise Baby, and Starshine Salon. Love the idea of a one-of-a-kind vintage nursery, but don’t have the budget for high-end antiquing? No worries! Turn thrift-store finds and cheap antique treasures, like lace doilies and vintage handkerchiefs, into beautiful vintage décor with these easy and creative decorating ideas. Photo via Hen House Homemade. This charming patchwork accent wall is made up of odds and ends of vintage wallpaper, carefully cut and pasted together to look like a beautiful heirloom quilt. Love this look? See how the project came together on Hen House Homemade. Photo via Cozy. Cottage. Cute.. Looking for attractive storage ideas for your nursery or playroom? Add caster wheels to vintage crates to create beautiful rolling storage boxes. These wooden beauties can be picked up cheap, and are perfect for storing small toys and books. Rustic wooden crates can also be easily converted into beautiful, vintage wall shelves. This antique bottle crate is the perfect fit for displaying matchbox cars and other tiny treasures. Simply add weight-bearing brackets to the back and mount to the wall. Have a thing for vintage lace? Turn antique doilies into something truly beautiful! All you need is an inflatable beach ball and some Mod Podge. Soak your doilies in Mod Podge, and arrange them on the beach ball, ensuring that the edges of each doily touch. Once the lace dries and becomes stiff, deflate and remove the beach ball. Cut a small hole near the top, and insert your light kit. Photo via Mandy Busby Creative". A pack of old illustrated flashcards makes for charming wall art in this sweet nursery room. Pick and choose a few of your favorites to frame, or display the entire collection on a miniature clothesline. Turn the pages of a classic illustrated storybook into whimsical nursery wall art! Found in most antique stores and second-hand bookshops, vintage storybooks are easy to come across and will usually only run you a few dollars. Simply cut out your favorite pages and frame. Turn a secondhand find into a vintage work of art! Antique stores often boast a large and varied collection of vintage paper goods. These timeworn treasures come a dollar to a dozen and make for excellent Modge Podge material. Create a travel-themed accent piece using old postcards and travel brochures or a one-of-a-kind dresser from vintage sheet music. The possibilities are endless! An antique toy wagon doubles as a rolling bookcase, adding a playful touch to this vintage-inspired nursery space. Photo via The Wise Baby. 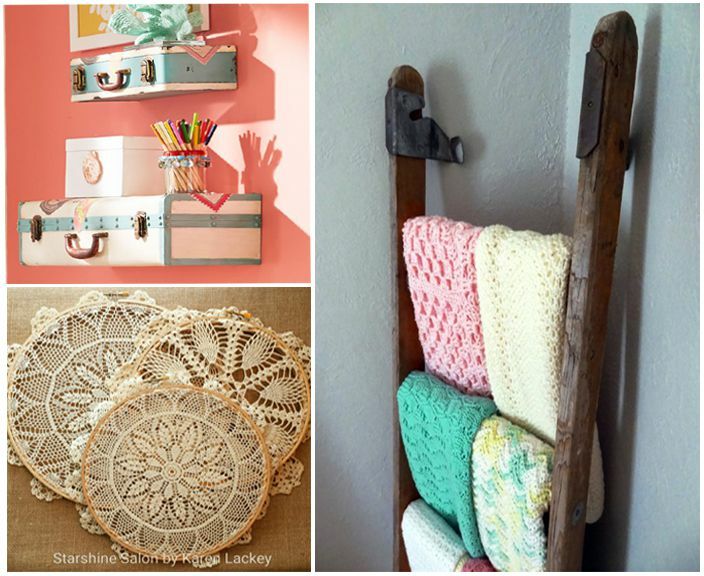 An old wooden ladder is the perfect way to display a collection of crochet blankets or heirloom quilts. Photo via Ashley Thunder Events. Create a beautiful DIY mobile for your little one using antique lace doilies! Simply soak each doily in a Modge Podge solution, and lay them flat. When they have dried solid, hang them from a large quilting hoop or a wicker wreath. Photos via (Clockwise from top) Makely, and Makely. Looking for vintage wall décor? Vintage baby clothes can be a charming choice! Try framing your family heirlooms in box frames or hanging antique finds on pretty hooks. Can’t decide? Do both! Photo via Wild and Free Designs. This old-fashioned globe makes a moving statement, transforming a thrift-store find into an adorable message of love! Simply paint a message of your choice and cover with a clear coat of varnish. Lacking a steady hand? Try using a decal! Painted in a trio of pretty pastels and lightly distressed, these reclaimed wood shutters couldn’t make for cuter wall décor! A fabric strip banner completes the picture, making the project so Shabby Chic. A collection of lace doilies stretched tightly over quilting hoops makes for beautiful wall décor. Choose a hoop that is slightly smaller than your doily so that only the finished ends escape the frame. Place a small amount of glue around the inside edge of the hoop, pressing the lace down as you go. Leave the ends exposed, or trim the excess. Give a vintage hankie a home with this simple DIY idea! Soft, delicate and often hand embroidered, these practical personal items are practically a work of art! You can even give your creation a creative boost by sewing on buttons, crystals, flowers and other pretty charms. Wondering what else you can do with a vintage hankie? These whimsical wall kites will make your heart fly. Photos via (clockwise from left) Pinterest, Pottery Barn Teen and Petite Litarary. Dreaming of a travel-themed nursery? These vintage beauties offer a wealth of possibilities! Turn a vanity case into a diaper caddy, or use larger cases to store toys or books. Add wheels to create roll-a-way storage, or make your own adorable DIY wall shelves. Photos via Miss Mustard Seed and Catch My Party. Vintage design is all in the details! Try using mason jars and other repurposed glassware to display small treasures like wooden blocks, vintage buttons or marbles. You can also create theme-friendly displays using large apothecary jars, which will help keep dust and curious little fingers away from your favorite finds. Have a Magpie-like love of tiny, shiny treasures? Old keys, antique flatware, and even bits of broken jewelry can make for a one-of-a-kind baby mobile full of vintage flair. Just ensure that all pieces are tightly fastened, and keep these important safety tips in mind. Need help decorating your vintage nursery? Check out these helpful style tips.